Earning quality backlinks is difficult. But most of us reading this post will know that backlinks boost your rankings and the end-results are worth the effort. Well, there are at least 7 ways that backlinks boost your business – and only one of them is about search engine rankings. Read this post, skim through the examples and the next time you’re asked that difficult question, you’ll have a lot more ammunition to prove your worth powerfully. Well, we all know that, don’t we? It is search engine optimisation that brings us all here. We want higher rankings on Google, not just to satisfy our egos, but because high rankings bring more prospects to our websites. And the best way to boost your SEO rankings is through earning quality backlinks. But that’s not the only way that backlinks help and if we stopped there in explaining the value of our work, we’d be seriously underselling ourselves. Let’s look at five more reasons – having them at your fingertips will show you know the real value of your work. The biggest thrill after getting a high-quality backlink from a high-quality site is that you see an immediate spike in traffic. Such sites have a lot of readers and many of them that read posts of interest, will click on the backlinks and arrive at the target site. So, you get real traffic. 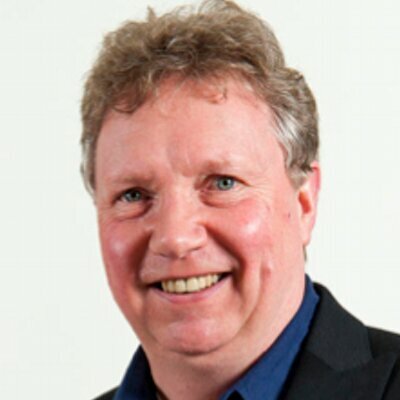 Even better, the people who click are likely to be feeling positive about you – they’ve just seen you on a trusted publication, they’ve read what that publication says about you and they’ve actively decided to click through. That turns them into qualified prospects that are likely to buy your stuff, sign up for your list or do whatever else you want them to do on your site. The second biggest thrill after getting quality backlinks is that you often get more backlinks without even asking for them. A percentage of readers will have their own blogs and they love to share good stuff – journalist too love to write about what they find online. That means when they read an interesting post, they’ll write about it, link to the original post, and at the same time may even give a backlink to your site. Take this clever example of a baker who left his employment to set up his own small business. He decided to show off his skill by writing his resignation on a cake to share with his colleagues. 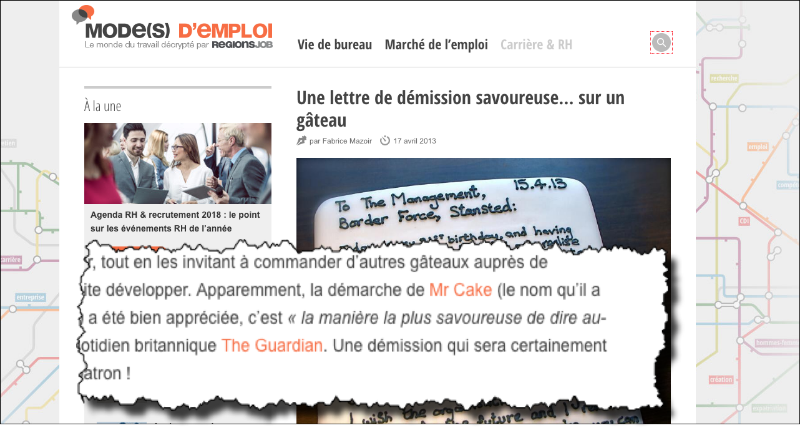 Mr Cake receiving a backlink from a French employment-news website. 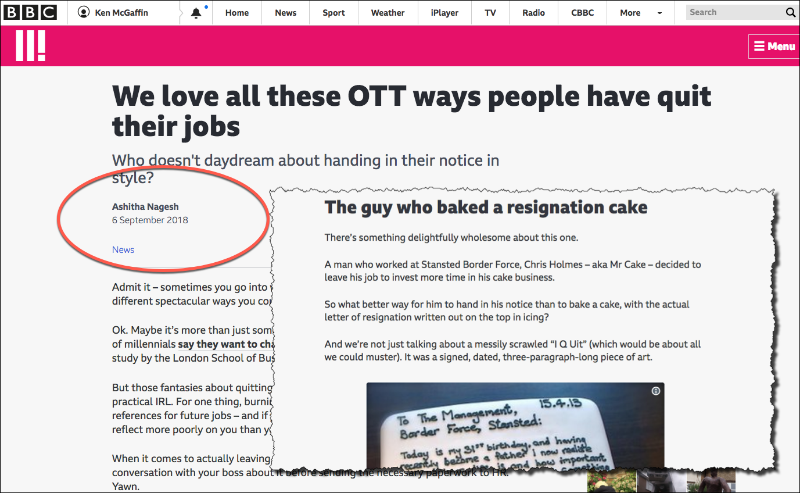 I’d be pretty sure that Mr Cake didn’t chase after that backlink – it’s a great example of how backlinks on one authoritative site can generate backlinks from others. Backlinks keep working for you month after month, year after year. ‘Mature’ backlinks that have been around for years still help your rankings, they still bring click throughs and they can still be featured in news stories for years to come. 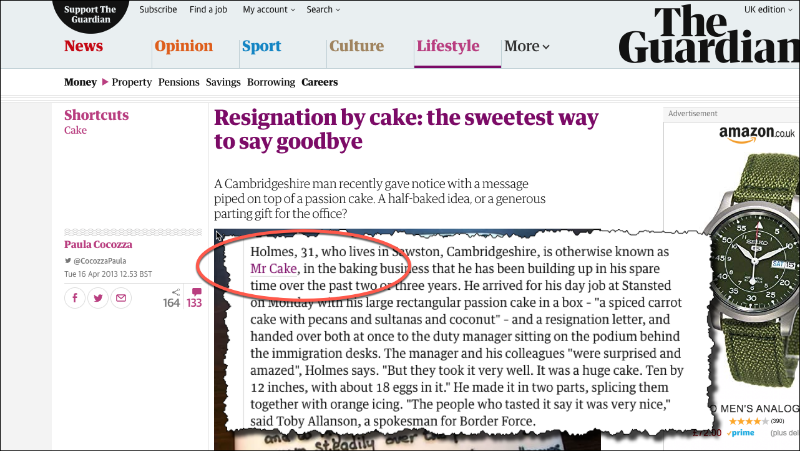 For example, I discovered the Mr Cake example through a news piece published on the BBC on September 6, 2018 – almost 5 years after the original story broke in April 2013! This is one long-term benefit is not often given the credit that it deserves. It’s worth doing a link analysis of some of your most successful posts, both published on your own site and on external sites, and find examples you can share with your clients. If potential customers see you featured on and get backlinks from some of the top blogs and news sites in your industry, they’re going to trust your brand much more. The more people trust you, the more likely they are to buy from you. And ‘complementary businesses’ are more likely to suggest partnerships or business opportunities. Publishers are also more likely to reach out to you with interview requests and they’ll take more notice when you pitch a guest post request or send out a press release. There’s no doubt that quality links bring considerable bragging rights. The simplest example of this is “as featured on” followed by the logos of the New York Times, BBC, SearchEngineLand.com or any other great blogs in your industry. But pages like this serve a bigger purpose than just bragging about your success. They also show other bloggers and journalists that you know what the media wants – and that can lead to more interviews and more news coverage. Quality backlinks come from building relationships with key influencers. And that’s a two-way street – as well as asking, you should be giving to top influencers. So never be shy of giving well-earned backlinks to other sites. It’s a powerful way of doing someone else a favour – and who knows what you could get in return! Which backlink is good in your opinion? For me, I’d rate ‘guest post’ highly not just for the link value but because of the new audience it would give me access to. I’d rate profile link after that. And each of the other two might give me some benefit depending on the situation. 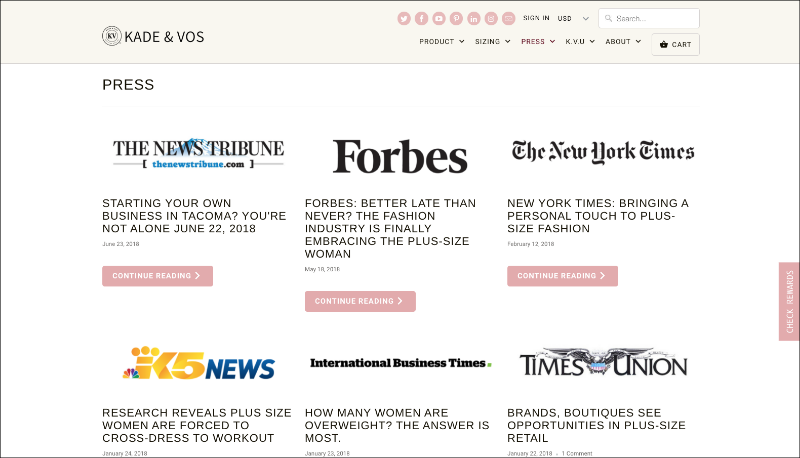 "You could also create a press page like the plus-size fashion retailer, Kade & Vos (you can read our interview with founder"
I think you need to [insert link] ! This is useful like a evergreen article. While I will definitely agree with point two, I have to respectfully disagree with point one. While maybe a few years back this may be true, of late I’ve seen web sites with only junk/spam back links come up ahead of good content with authority too. Thanks, Carl. I hear your frustration. Not all backlinks are equal – mediocre link strategies no longer work long term. Google continues to raise the quality bar and we do have to respond with more creative content, PR and link building strategies. It’s high-quality backlinks that will bring all the benefits above. What your competitors and other websites do can irk you – you can’t stop them doing what they do – but you can outsmart them and one of the best ways to do that is to build quality backlinks. You can’t really separate them. You should always be looking for relevant links – and sites of medium authority are still useful – but don’t be too narrow in your definition of ‘relevant’ – think of the many ‘topics’ that sites can get links from (see the topics tab in SiteExplorer). Once you’ve build a base of good relevant backlinks, you should expand your focus to authority sites.